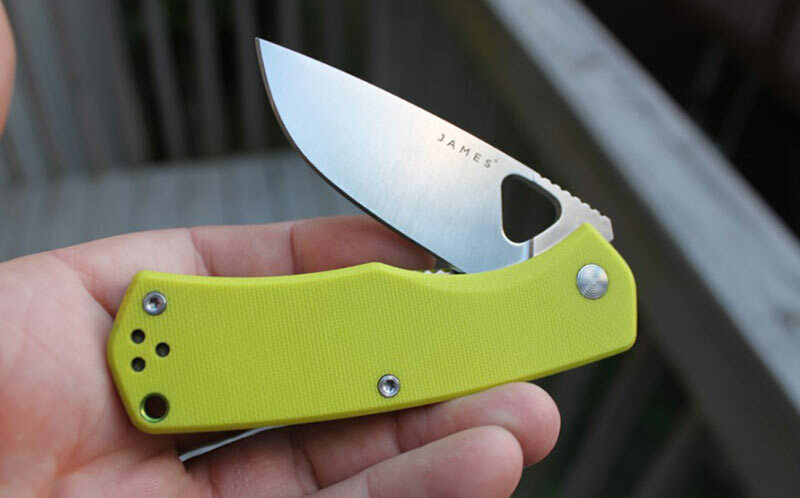 The James Brand is a relative newcomer to the knife scene, having only been around since 2012. They formed in Portland Oregon in 2012 with the intention to “design and make the knives we use every day.” We recently published an interview with the new CEO of The James Brand, Mike Hoefer, which shed some insight on the fledgling brand. In this review we’re looking at the Folsom. The Folsom is the newest addition to their lineup, which is preceded by the Chapter, a Titanium framelock in D2 tool steel, and the County, a traditional-style slipjoint in 12c27 steel. Both are a little fancier in terms of materials and higher priced than the Folsom (which retails for $99), with the Chapter coming in around $275 and the County near $150. The Folsom is designed as a more affordable, Everyday Carry-oriented liner lock knife that does a little bit of everything for everyone. The Folsom comes in five variants: white with a black coated blade, black with a satin or black coated blade, and blue or “electric moss” with a satin blade. Our tester was the electric moss color, which is also the James Brand’s signature shade – found on the thumb studs on the Chapter, as well as the lanyard tube of the Folsom. It’s thin, light, not too big, practical, and a little eccentric – let’s take a deeper look at the Folsom and see how it stacks up as an EDC knife and against the competition. The Folsom does a lot of things right in conventional ways, and the blade is absolutely one of them. It’s a classic drop point shape, with a generous belly for roll cuts and slicing. It’s a full flat grind with a diagonal plunge line running from the middle of the thumb hole to just slightly ahead of the bolster, making the ricasso very small. Blade stock is 0.11” and total blade length comes in at 2.75”. The Folsom’s blade is made of Carpenter CTS-BD1, which is a relatively recent addition to the market. As far as composition goes, CTS-BD1 is fairly similar in makeup to VG-10 but with less molybdenum and silicon making it softer and less fine grained, while having significantly more carbon and chromium (the two primary contributors to hardness, wear resistance, and corrosion resistance) than 8Cr13MoV, which is commonly used in a lot of Chinese-produced knives. In practice it’s a fairly soft steel, happiest in the 57-58 RC range, but it’s got a clean grain structure, it takes a great edge with remarkable ease, and it’s very rust-resistant – all ideal qualities for an EDC knife. A super-slick satin finish suits the Folsom’s handsome appearance well. Deployment on the Folsom is done via a triangular-shaped thumb hole with rounded off corners. When the blade is closed, the bottom of the hole is obscured so the actual area to get your thumb into is more of an oval, and in my opinion the Folsom could use more of a cutaway on the show side of the handle so less of the thumb hole is covered. As it is, it’s a bit tricky to get a proper purchase on it for reliable deployment. The detent is well tuned, though, and using the pad of your thumb you can flick the Folsom open with a satisfying “click” once it’s worn in. The Folsom uses a liner lock, which engages the tang without issue 100% of the time – no vertical blade play was observed during my time testing it, and the only horizontal blade play was a result of juggling pivot tension. With the Folsom’s overall resemblance to the Spyderco Chaparral I can’t help but think that a backlock would suit the dimensions and overall demeanor of the Folsom better. 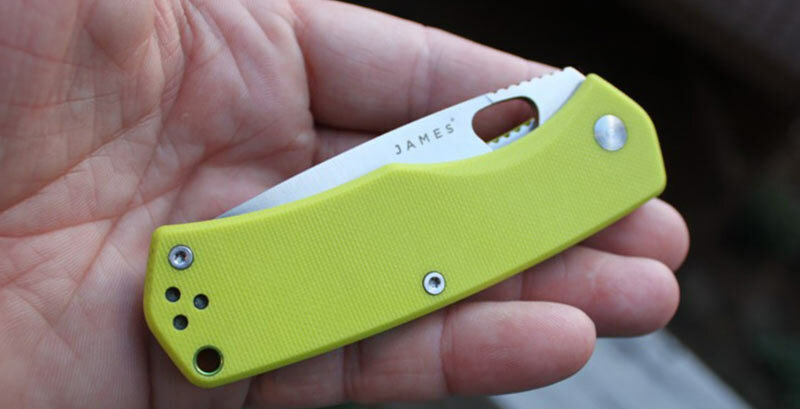 The James Brand adds a line of jimping to the surface of the lock bar that your thumb comes in contact with when you’re closing it but the whole thing still feels “cramped” – considering the entire knife is only 0.39” thick there’s a lot of real estate to pack two scales, two liners and a blade into. A lockback would suit the shape of the knife in hand well and seem to better fit with the overall design idea better, offering a stronger lock than the narrow liner could with less ergonomic difficulty. The Folsom is a well made knife, and even during a full disassembly no defects in manufacturing could be found. 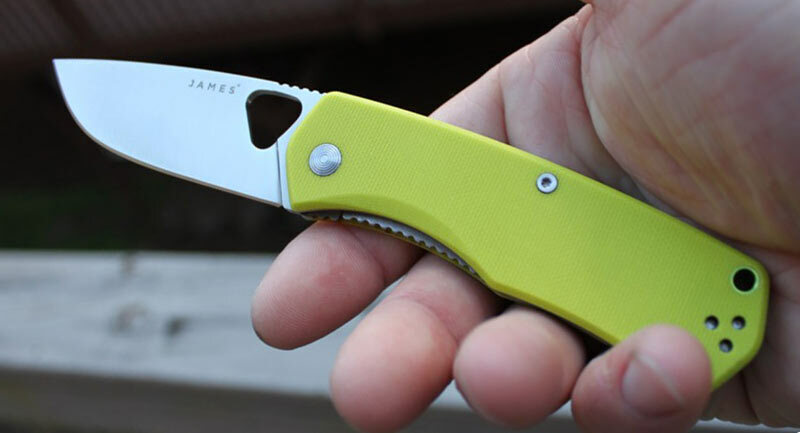 We’re not sure who is making these knives for The James Brand, but they’re doing a good job and it’s clear that James is particular about the quality of the products they’re putting out. All the hallmarks of a well-made knife are here. The scales, liners, and stainless backspacer are all completely smooth when you run a finger across them. The three counter-sunk screws that secure the pocket clip sit perfectly flush with the surface of the clip when you tighten them all the way down. Blade centering is optically perfect. The bright-green lanyard tube is press fit evenly on both sides and has a chamfered edge on one side to make passing a piece of paracord through easier. The plunge line tapers smoothly all the way from the tip to the ricasso, and the grinds are perfectly even from the miniature sharpening choil all the way to the tip. Speaking of sharpening choil, this one’s done right: not big enough to drag on materials, only a tiny bit of “beard” and very short so as to not waste cutting length. It’s not a fancy knife like, say, a ZT 0392, but holding it in your hand you can tell that the details were poured over and they wanted to make sure this knife was made right. An inspiring outcome for such a new brand; if only Buck made knives this well! There aren’t a ton of funky, weird features to this knife. In fact the most noticeable is probably the bright green handle scales, with their smooth texturing. They look great but they attract dirt like Pig-Pen, quickly tarnishing with brake dust and grease. As I’ve mentioned before, a Magic Eraser (or any melamine foam cleaner) works wonders on dirty G-10, but this Electric Moss may not be the color of choice for mechanics, even if it is so choice for Instagram. The clip is relatively wide and split in the middle, coming to a single point just shy of the mid-body screw. It’s not a deep carry affair but it’s otherwise totally excellent, leaving a half-inch of the knife protruding from your pocket to grab and pull. Spring tension is remarkably strong, but the shallow ramp angle that extends out relatively far at the end of the clip makes it easier to slide over your pocket seam as well as less of a wall scratcher, and it’s very firmly secured by the three screws. The Folsom is tapped for tip-up right or left handed carry. The angle of the upper bends leaves enough of a gap between the peak of the clip and the scale so that it can be pushed all the way down against the seam. The pivot screw is what I’d called “mildly decorative” with a muted radial pattern milled in on both sides, but thankfully it’s just a Torx fitting – as are the body and clip screws, so no worries about annoying proprietary hardware. Branding is fittingly minimal – the show side of the blade has “J A M E S” etched on in front of the thumb hole, a serial number on the lock side up against the bolster, and the James Brand’s odd geometric symbol on the clip. No shouty logos or text here. Other than the aforementioned sticky action when closing, the Folsom is really a pleasure to use. Carry is superb, disappear-in-your-pocket good thanks to the great clip and the remarkably thin cross-section of the knife. At under 0.40” thick and with flat scales it doesn’t take up much depth, and with the spine only barely protruding from the handles it doesn’t occupy much width either. At 3.40 ounces it’s heavier than some other similarly sized knives: it’s almost an ounce heavier than a Delica 4, 0.8 ounces heavier than a standard plastic-handled Mini Griptilian, and a half-ounce heavier than a small Sebenza. The full stainless liners as well as the rather large solid stainless backspacer are probably to blame – skeletonizing the liners and switching to standoff construction could probably save at least half an ounce, but the knife does feel extremely solid in hand in a way the Delica doesn’t. Still, owing to the ratio of handle to clip length, the Folsom doesn’t pendulum around in your pocket at all – so overall carry is very good. It’s a great cutter for normal tasks. Slicing abilities are superb thanks to blade geometry that leaves the Folsom thin behind the edge, with a narrow flat grind and a smooth satin finish leaving very little friction for whatever you’re cutting to grab onto. Piercing ability isn’t as strong as slicing, with a rather high tip at a wide angle above the centerline of the handle that’s fairly thick on the spine side – but this is an all-purpose blade and it gets the job done. The factory edge was great, able to shave hair or slice printer paper with ease. I’m not sure who’s doing the heat treating on the blades, but considering the physical properties of CTS-BD1, the Folsom held an edge far longer than I expected it to, being more comparable to 154CM or S30V than AUS-8A or 8Cr13MoV in terms of retention – maybe this is also due to the edge geometry, but it’s very impressive. It’s also a snap to sharpen, like AUS-8A or 14c28n and easier than VG-10 for sure. No corrosion was noted during my testing despite frequent use cutting food, partially due to the satin finish which leaves less of a porous surface area for moisture to intrude into and also the composition of the steel. Ergonomics are simple but solid. The lack of a forward finger choil is a demerit but it would admittedly eat up some sharpened edge real estate which is already at a premium with a 2.75” blade. Jimping is appropriately placed, wide and not overly sharp – there’s a run along the blade’s spine up to about midway through the thumb hole, and the jimping underneath on the locking liner also extends out past that to the end of the scale providing extra grip for your index finger. The swell in the middle of the handle fits in between your index and ring fingers nicely, and the pocket clip is low enough against the scales to not provide any sort of hot spot or be noticeable when you’re using the knife – as it should. The same thinness of the handle that makes the Folsom great to carry makes it feel flat in your hand in a way that a Delica or a Native doesn’t; a touch more depth to the handle scales would help but it’s a trade-off. After several weeks of carry and daily use the Folsom is still solid with no weird wiggles in the frame or sloppy lock-up to speak of. The first thing that came to mind when I held the Folsom was Spyderco’s excellent lockback gentleman’s folder series, the Chaparral. The new version with Raffir Noble acrylic handle scales is a fascinating knife on an aesthetic level, but even the standard version in carbon fiber-laminated G10 is a good comparison. It’s got a 2.81” blade with a 50/50 forward choil (so an actual cutting edge of 2.3”) and a very thin handle profile (0.34”) but with a lockback instead of a liner lock. It’s extremely light at 2.50 ounces (CF/G10 version, 2.30 for Raffir Noble!) and the blade steel is CTS-XHP, a step up in performance from BD1. The blade is full flat ground from ultra-thin 0.08” blade stock so it’s a natural slicer, and the deep carry wire pocket clip is a rarely seen bonus. The Raffir Noble version runs about $120 on BladeHQ, and the CF/G10 version is about $125. There’s also the Lightweight Native 5 – more heavy-use oriented but still with similar dimensions. It has a 3” full flat ground leaf shape blade, a full forward choil, and the featherweight FRN handles are linerless which explains the 2.45 ounce weight. It’s also a backlock like the Chaparral, and it’s available in three different versions in lightweight configuration: the standard S35VN steel is only $87, CPM-S110V is $113, and the insane Maxamet Micro-Melt steel version is a hefty $143. The standard Benchmade Mini Griptilian (556) with a drop point blade and thumb stud opener is close in size (2.93” blade) but considerably thicker in the handles (0.51”) compared to the Folsom. Plastic handles and skeletonized liners help keep the weight down to 2.6 ounces, and the standard version in 154CM steel is about $90. The Axis Lock is always a joy to use. There’s also the super-thin Benchmade 530 axis-lock knife, at only 0.37” wide, but with a slightly longer 3.25” spear point in 154CM for $102. 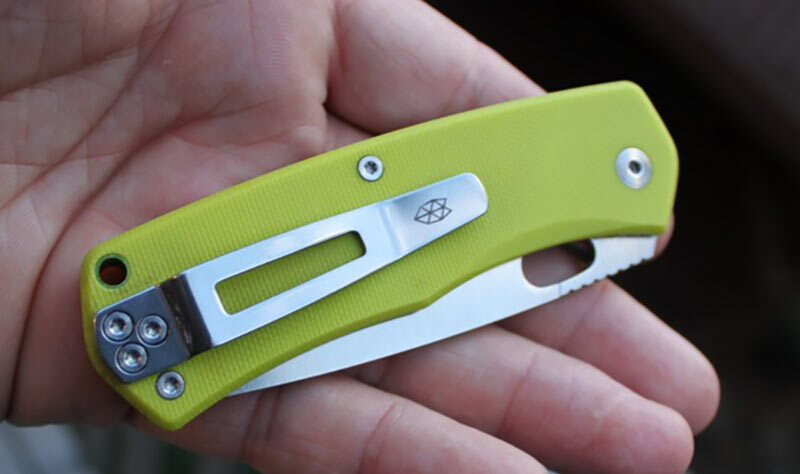 The brand new 535 Bugout is even lighter, weighing in at a remarkable 1.86 ounces(!) with a 3.24” S30V drop point blade for $115. There’s plenty to choose from Kizer Cutlery in this size and price range, too. Generally, their Vanguard series comes in under the price of the Folsom, with G10 scales over stainless liners and VG-10 steel. The Vanguard Vigor is a great deal at about $60, with a thumb stud opener and stainless liner lock, and a 3” hollow ground drop point for EDC tasks. There’s also the Small Hunter designed by Justin Gingrich, with a 2.5” hollow ground drop point in CPM-S35VN steel and green or black G10 handles. At $82 it looks like a great deal and a unique, useful design. If you want to spend a little more, the Kizer Envoy at about $135 and the Active Bantam at about $125 offer titanium framelock handles with bearing pivots and flippers, also in S35VN steel. The hammertone-style texturing on the bolster of the Envoy in particular looks cool, and the Envoy’s 3” full flat ground drop point looks like a solid slicer while the Bantam’s hollow ground drop point and chunky handles give it the appearance of a Kershaw Cryo, only better. And finally, there are three different small knives from CRKT that all warrant your attention. One that’s currently hotter than a campfire is the CRKT Pilar, which ranks as the #2 folding knife between 2”-3” on BladeHQ when sorted by popularity (right behind the personally underwhelming Spyderco Para3). It’s heavy for its size – 4.20 ounces with a 2.40” blade and only 5.90” overall. The materials aren’t exotic either – solid stainless handles with a framelock, 8Cr13MoV blade, plastic washers – but at $25 it’s solid, well built, and has Jesper Voxnaes’ design execution all over it. 0.15” blade stock and a beefy forward choil mean it’s a baby knife designed for big work. You can check out our review of the pocket cleaver/sheepsfoot bargain blade here. There’s also the CRKT Batum, the baby version of the CRKT Batum we tested here a few months ago. Thankfully it’s a good bit lighter than the chunky original at 3.6 ounces, and the 2.5” 8Cr blade has a high flat ground to make the best out of it’s wide 0.15” stock. Finally, the Burnley-designed Squid is a virtual no-brainer, especially in this cool smokewash finish, for only about $20. A 2.25” 8Cr blade with a thumb stud, stainless framelock, a good clip, and tons of character for less than $20? Why not? The Folsom is The James Brand’s first earnest attempt to truly go mainstream with a knife, and with only a few exceptions they’ve succeeded. You can tell by looking at the “Alternatives” section that they’d made a wise choice – there aren’t a ton of knifes that truly resemble the Folsom so it doesn’t come off as “cookie cutter” at all to me. Things that I think could be improved are the closing action, which is still a bit stiff, and the price. I think for the materials the Folsom offers the price is maybe $20-$25 too high, but in its defense it is an extremely well-made knife, with the kind of fit and finish that’s surprising from such a new company. The price would also be totally in line if they made the blades out of S35VN or Elmax. I also think in general the design of the knife lends itself more to a lockback than a liner lock due to the narrow dimensions of the handle, but that’s a matter of preference – the liner lock secures the Folsom just fine. As an EDC knife for normal tasks the Folsom is a pretty sweet tool – the type of thing you get attached to because of the way it works rather than the way it looks. I get the feeling this was the idea when James was designing it, wanting their knives to be used not put on a display shelf. It carries extremely well, it’s solid, it cuts well, and at least on our sample the color itself is eye-catching. The super-thin handles are a two edged sword, feeling a little hollow in the hand, but it’s not a deal breaker. Overall, the Folsom fills the small EDC role very well, up there with the Delica, Chaparral, or Native 5 in my book. A stylish and well made pocket knife from a new brand looking to build reputation. A compelling EDC choice from a brand you may not have heard of – but surely will soon.